It is said that Beren and Lúthien returned to the northern lands of Middle-earth, and dwelt together for a time as living man and woman; and they took up again their mortal form in Doriath. Those that saw them were both glad and fearful; and Lúthien went to Menegroth and healed the winter of Thingol with the touch of her hand. But Melian looked in her eyes and read the doom that was written there, and turned away; for she knew that a parting beyond the end of the world had come between them, and no grief of loss has been heavier than the grief of Melian the Maia in that hour. Then Beren and Lúthien went forth alone, fearing neither thirst nor hunger; and they passed beyond the River Gelion into Ossiriand, and dwelt there in Tol Galen the green isle, in the midst of Adurant, until all tidings of them ceased. 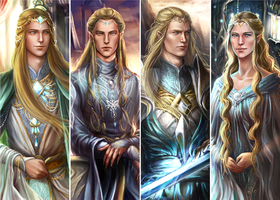 The Eldar afterwards called that country Dor Firn-i-Guinar, the Land of the Dead that Live; and there was born Dior Aranel the beautiful, who was after known as Dior Eluchíl, which is Thingol's Heir. No mortal man spoke ever again with Beren son of Barahir; and none saw Beren or Lúthien leave the world, or marked where at last their bodies lay. Very nice and romantic Artwork! Captured the poignancy of a father and daughter moment...really love all of your beautiful artwork, you are truly a gifted and amazing artist! Wow! Elves look like angels, don't they? Gorgeous! I tried to achieve this). Thank you. Даже не читая аннотацию, подумал, что это именно тот момент, когда Лютиэн исцеляет своего отца: буквально физически ощущается, какое с плеч Тингола свалилось тяжкое бремя. Удивительное умиротворение - очень редкий момент во всей истории Берена и Лютиэн, где иной раз страсти кипят такие, что свариться можно - и этот момент схвачен, как мне кажется, очень точно. В общем, пять с плюсом, ибо ставить за такое оценку ниже было бы оскорблением самого Толкина. Вот. Ужасно жалела, что не умею делать анимацию, потому что в голове это была живая картина примерно как в Двух Крепостях (помните, тот эпизод с Теодэном и Эовин?). То есть буквально физическое преображение. Рисунок тем и плох, что он как бы мертвый - передает один застывший момент в отличие от анимированных рисованных, скажем, гифок. И та же история была с Эльвинг, превращающейся в чайку. Так и вижу перед глазами как она бежит в сумерках, а потом ррраз и вот уже летит птица. Передача этого самого момента - самое интересное, но сделать это можно, мне кажется, только при помощи кино. Или трёхмерки в Майе. Эх. You're very welcome; truly talented works ! Happy 2016 BTW; hope you'll have an awesome year ! Same to you) Best wishes from a frozen Russia). Pee-ew!... The past year has been a trying one. Of great changes and great uncertainty. For me at least. If I didn't have my work, I think I would have gone crazy, definetely. Thanks a lot ! I hope your 2016 would be great ! I always forgot just HOW sad Beren & Luthien's story is. Yeah. And I want to see this story in the movie (but only with one indispensable condition - totaly accurate and realistic approach). This is so beautiful! You made Menegroth such a gorgeous place. And I love the poses and Luthien's dress. Beautiful pose, expression and detail. потрясающая сцена! очень нравятся фон и лица. Thank you for at last creating a true Luthien! Очень жду! и не я наверное один!) Удачи и побольше идей! Out of all the Luthien images I've seen, I have to say you drew her best. Wow) Thanks. I just had to draw a very very beautiful girl. This is such an amazing picture. The scenery, the clothes, the interaction of father and daughter, it all fits together. I just read the Silmarillion and I think the story of Beren and Luthien is one if not the best Love-Story there is (and way better than Romeo and Juliette). This is a warm scene with a lot of feeling, that doesn't get any real attention. You should enter it in the current LoTR Club contest. Why? I'm not trying to impose my work. If someone is interested he will recommend to friends to see. Well, the contest was for rarely-done scenes, and it seemed appropriate and worthy of being noticed by Tolkien fans at large. Your pictures generally are. But then I probably will be forced to draw something specifically new?